We’d love your help. Let us know what’s wrong with this preview of Expand Social Security Now! by Steven Hill. To ask other readers questions about Expand Social Security Now!, please sign up. Be the first to ask a question about Expand Social Security Now! In the interest of full disclosure I received this book in exchange for a review. I also receive Social Security payments through survivors’/widow benefits and having turned 65 this year I am now receiving Medicare benefits. Yes, this undoubtedly influences my feelings about Social Security and its future but I have tried (as best I can) to consider Hill’s arguments objectively. Obviously to many, Steven Hill’s views are controversial but the issues he raises aren’t necessarily new and opinions In the interest of full disclosure I received this book in exchange for a review. I also receive Social Security payments through survivors’/widow benefits and having turned 65 this year I am now receiving Medicare benefits. Yes, this undoubtedly influences my feelings about Social Security and its future but I have tried (as best I can) to consider Hill’s arguments objectively. Obviously to many, Steven Hill’s views are controversial but the issues he raises aren’t necessarily new and opinions are many on the subject. What I found interesting about this book isn’t what Hill believes to be a solution to an issue almost every American faces at one time or another. What I find interesting and valuable as an informed citizen is the back story about the history of Social Security, the politics behind the program and what our elected representatives have done or voted on in response to special interest lobbies, corporations and individuals. In fact I found myself reaching for my tablet so I could Google many of the names and ideas he wrote about. The first 80% of the book covers this range of detail and information. I found it the most interesting. The sheer amount of historical, social and political information was fascinating. Hill goes into great detail; naming names and explaining what a particular politician, corporation or private citizen has done to defend Social Security or what they have done to weaken and ultimately do away with it. The last part of the book is where he details his proposals with arguments on why he feels the way he does. While I doubt that many of his proposals would ever be implemented it’s thought provoking and interesting to think about his ideas. 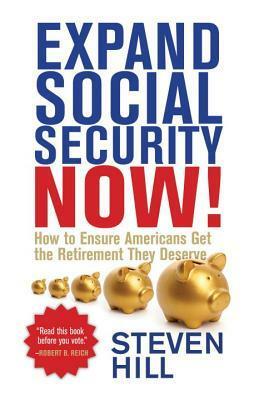 According to the author, despite an estimated unfunded liability of $13.4 TRILLION (1), social security is not broken and benefits should be DOUBLED. Who are the rich? You are if you contribute to a 401k. The author would eliminate you ability to do so. Do you own a home with a mortgage where you deduct your interest? Congratulations! You're rich too! And if the author has his way, you won't be able to deduct your interest. Do you own any stocks? Guess what? You are not paying your "fair share" a According to the author, despite an estimated unfunded liability of $13.4 TRILLION (1), social security is not broken and benefits should be DOUBLED. Who are the rich? You are if you contribute to a 401k. The author would eliminate you ability to do so. Do you own a home with a mortgage where you deduct your interest? Congratulations! You're rich too! And if the author has his way, you won't be able to deduct your interest. Do you own any stocks? Guess what? You are not paying your "fair share" and you will lose your capital gains tax "loophole" as well as the reduced dividend tax rate. Do you contribute to an IRA? Kiss it goodbye. Do your parents have any investments? Heaven forbid do they own a small business? Do you help run it and are you in line to inherit it? Forget about any step up in basis. More to come......., but in the meantime, don't waste your money on this book. Full disclosure: I won a free copy of this booklet in a Librarything giveaway. I was overcharged. I received this book from Good Reads. Every American should read this book; too many falsehoods are being spread by the Right about Social Security and this book puts many of those falsehoods to rest. Hill starts out with a comprehensive history of Social Security and how too many hard working people were living on the street, without any savings. (Thanks FDR!) Today, especially, corporate pensions are disappearing and working people, especially women, are living in poverty. The housing bubble crea I received this book from Good Reads. The housing bubble created by lack of government control (thanks George W. Bush!) added to the disarray of the middle class. Too few taxes on the truly wealthy and falling incomes cause a huge recession that this country is finally, slowing, recovering from. Quite a captivating read. Love he author's proposals. They make such good sense - therefore Washington will never consider them. I hope somebody in Washington will take this material and run with it. How great it would be for our country. I won this book on GoodReads. I love the insights it provided.